The cupcake challenge has some luscious looking cupcakes. I was inspired by the red heart on the vanilla iced cupcake. The die comes from Simon Says Stamp, the sentiment from Lawn Fawn. Oh my--such a wonderfully classy & classic Valentine! I really love this one, Cat! wonderful CAS card, Cat! that certainly is a lovely die and so pretty in red! A beautifully elegant card! So much fun to make Valentines! Beautiful CAS card, Cat...your heart is gorgeous! I really love the elegant but simple beauty of your card! That is such a pretty heart. 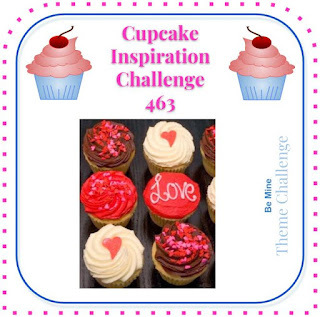 Thank you for joining in on our challenge this week over at Cupcake Inspirations. That's what I call CASilicious. Fabulous card. Thank you for joining us at Cupcake Inspirations, hugs - Ishani.